-We Rescue Bully Dogs Too! Snickers was a wonderful Rescue Dog! Snickers Helped train other dogs! Snickers helped raise funds for animal shelters and human societies! 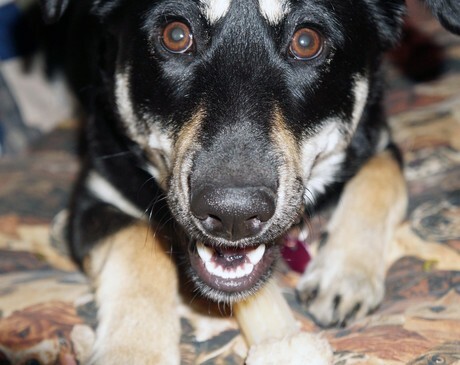 Snickers helped raise funds for needy/abused people and pets! He won numerous awards, was a Certified Pet Therapy Dog, the Mascot for the Abuse Bites program to stop bullying in schools, he did a series of amazing tricks, and he brought smiles, laughter and healing to everyone he met. He wore many hats--even a bunny outfit at Easter and was known as the Easter Beagle, but he was part of our family and passionate about RESCUING every person and animal. 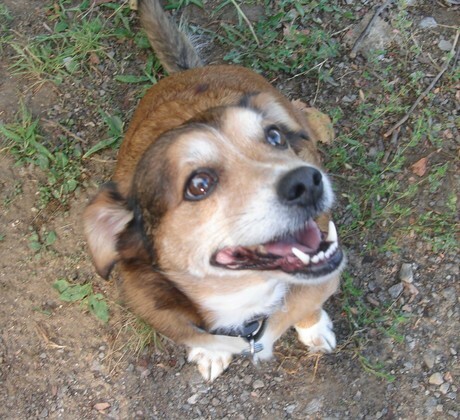 We will continue that legacy in his memory--Please consider giving to the BULLY BUSTER FUND in Snickers Memory Today! Thank you! Please specify what you are donating for. 100% of your donation will go to that cause. Right now we are taking up DONATIONS FOR A LOCAL FAMILY WHO LOST THEIR BABY so they can buy a GRAVE HEAD STONE. Thank you for you amazing contribution. This is Precious. She was roaming the streets for over a month, possibly abused, neglected, and abandoned by her owner. When Lisa got the call about Precious, she already had three small dogs in her home. Still, realizing the urgency of the situation, she took the rescue into her home. "I wasn't sure how a big rescue would do in our home, since we had three small dogs already, but I couldn't let her go back on the streets either." Precious struggled with food and fear aggression as well as anxiety separation. She was so fearful she wouldn't leave the porch unless Lisa walked out into the yard with her. She'd hurry up and go potty then run for the door. Afraid of being rejected and abandoned, she was restless and on the move constantly. Lisa gave her a lot of affection, took her for long walks, and worked with her on basic commands. She learned very quickly and passed her AKC Canine Good Citizens Test a few weeks later. She's an amazing dog! 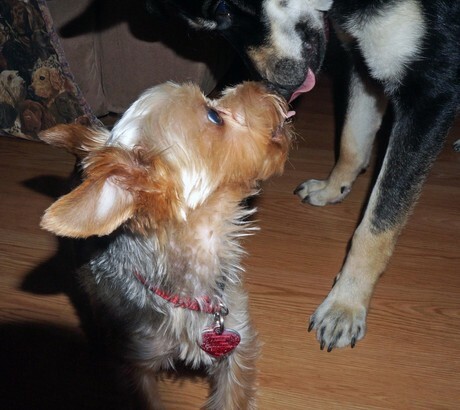 Lisa's four pound Teacup Yorkie, Lover and Precious played together every day. All four dogs got over their growling and adjusted well. They even shared their bones and food! This has all came together very quickly in just a matter of a couple months. Rescuing is never easy, but it's definitely rewarding! UPDATE: In October 2013, Precious was adopted into her furever home with a precious family who has three acres for her to run and play on every day and she's doing amazing! 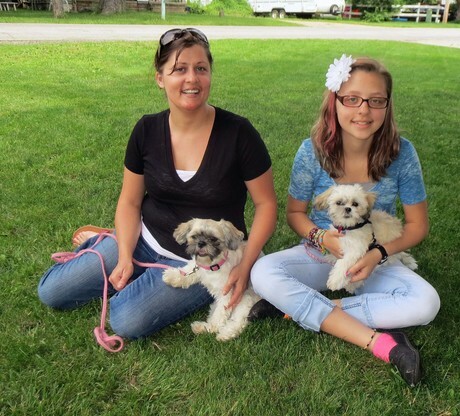 Read Blog to see picture of her new family! Just goes to show you, there are NO THROWAYS! Every dog and every person deserves to be rescued and many times will go on to rescue others.